Wildfire G31735 in the Robson Valley on August 10. Some personal news: I’m about done with wildfires. The western half of North America has turned into a funeral pyre for forests. We’ve heard a lot about California recently, but British Columbia is also in serious trouble. 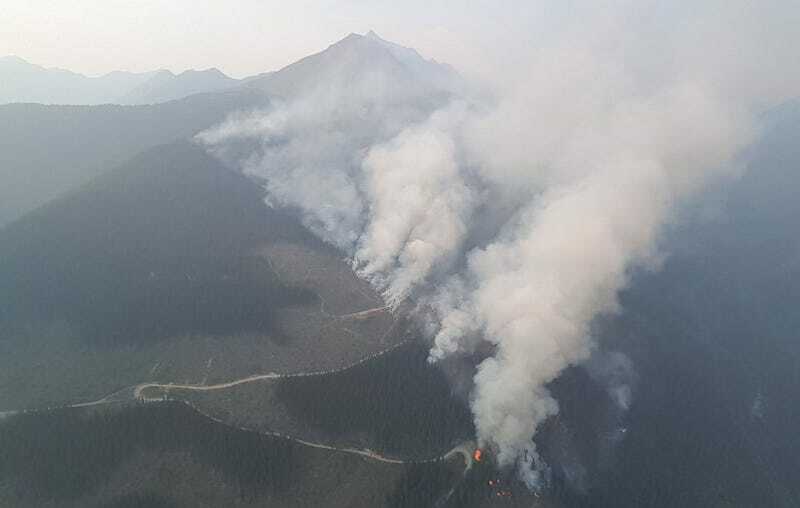 There are about 600 blazes currently turning the province into a smoldering morass, including 145 new fires that lit up on Saturday by a lightning storm. All those fires have sent a river of smoke and ash streaming across Canada and out over the Atlantic. The smoke is forecast to reach Ireland and the UK by Wednesday morning, according to tweets from European fire expert Mark Parrington. Washington state and other parts of the western U.S. are also getting a taste of the smoke as well it drifts south (in addition to smoke from California as it drifts north). Earther senior video producer Danielle Steinberg reports that her family is in Seattle right now sending her “a very oddly smokey” photo of her nephews. Earther has reviewed the photo and can confirm it is extremely smokey and Danielle’s nephews are very cute. Smoke is clearly visible on GOES-16 satellite imagery crossing the Atlantic. That may not be an option, though, with the CBC reporting that people living on closest to fires may have to flee at a moment’s notice. The province has already evacuated 900 properties to the northwest of the town of 10,000, but local officials are preparing for a major evacuation in town. To-date, fires have charred nearly 900,000 acres of the province. In comparison, the 10-year average area burned for the entire year is 373,230 acres. Last year, nearly 3 million acres of British Columbia burned and sent smoke spiraling over the Arctic in what was the worst fire year on record for the province. This year isn’t on that level, but it’s still pretty horrific. In addition to destroying forests and homes, changing the food web, and creating a public health hazard, the fires are also releasing millions of tons of carbon dioxide that was stored in trees. That means fires that are being tied to climate change are also making the problem worse. This post has been updated to note Mike Flannigan works at the University of Alberta, not the University of Calgary.